Similar to the pitra dosh, ‘Matra dosh’ is caused by the evil effects of Moon as the malefic planet. When moon makes combination with Rahu, Saturn and Mars, then matra dosh is formed. Various combinations are involved for the formation of this dosh. If the first house is affected by malefic planets and Moon is present in seventh house, Saturn or Rahu affects the fourth and the fifth house. If rahu, Jupiter and mars are present in the eighth house and, Saturn and moon in the fifth house, then matra dosh arises in kundli. How Matra dosh can affect you? As per the alignment of Moon with other evil planets, it directly affects the females in the house. Issues like problems in conceiving, mental stress and tensions, continuous illness, financial instability, friction between relationships with other members and other such problems are often faced by the native. Feeding the hungry and poor people with milk helps to get relief from this fault. Also worshipping the peepal tree and oragnising ‘grah shanti puja’ further solves the problems. Respecting the female members and seeking their blessings should be a regular act. This entry was posted in Puja and tagged ancestors, blessings, evil, have a little faith, Kundli, malefic planets, manes, mars, matra dosh, moon, Nivaran puja, Pitra dosh, pitras, problems, rahu, saturn, Shradh, shubhpuja, shubhpuja.com, worship. 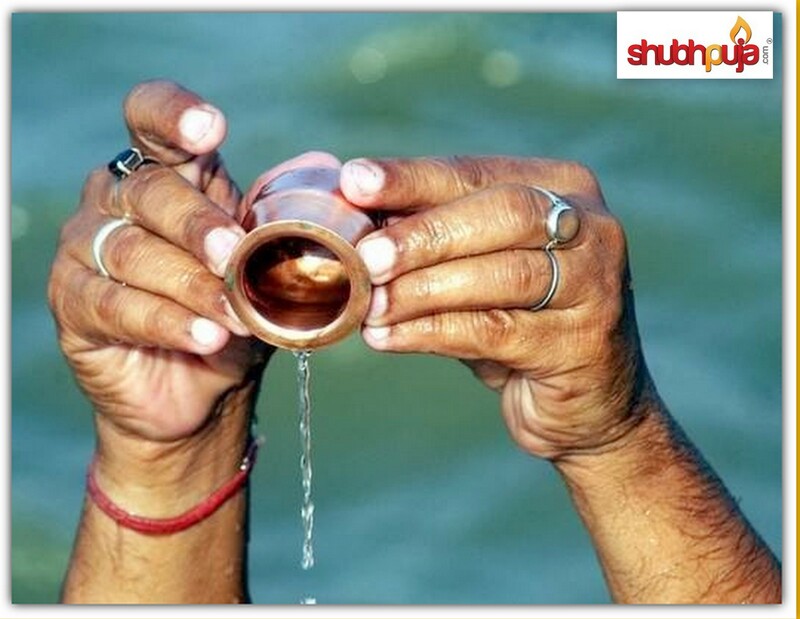 Every year there is a 15 day period ‘Pitru paksha’, when our ancestors are revered in different ways. It is said that during this period our ancestor’s souls come and visit us. This period falls in the lunar month of ‘Ashwin’ beginning with the full moon day in Bhadrapada or next day of full moon day, in North India whereas in the lunar month of ‘Bhadrapada’ beginning with the full moon day or day after full moon day, in South India. Though the months differ yet it is performed on similar days by them. Why should we pray for our ancestors during shradh? Psychologically and scientifically, shradh is a form of attachment or guilt within us that restricts us to lead a normal day to day life. It disturbs and haunts us day and night in our thoughts as we have a feeling of regret within us for the dead person. Thus shradh ceremony or any such offerings are the ways to fulfill the unfulfilled desires of our ancestors. It is an act to remind us about the execution of their pending jobs. By remembering our forefathers and seeking their blessings at the beginning of any auspicious work helps us to relieve ourselves from self-confessions. This entry was posted in Puja and tagged ancestors, ashwin, auspicious, bhadrapada, blessings, desire, faith, have a little faith, pitra daan, Pitra dosh, pitru paksha, pray, Shradh, shubhpuja, shubhpuja.com, worship. Past cannot be undone and future is unpredictable but the present can be glorified by our acts. Due to whatever reason, the shortcomings occurred in our birth chart and created stress but the blessings of our elders and God Almighty can always be a silver lining for us. Ayurvedic treatment may be long lasting and arduous but cures the disease from its roots. Similarly, it is mentioned in our Vedas that pleasing the ancestors and remembering them truly curtail our problems. First and foremost, performing ‘Shradh puja’ is considered to be the auspicious act to tranquillise the departed soul of our ancestors. How Shradh puja is performed? The holy puja is performed on the death date of the person or on the no moon (Amavasya) day of any month or during the 15 lunar moon days. By offering water, scented flowers, couch grass and sesame seeds through ‘Pitra dosh nivaran’. ‘Tarpan’ is the offerings made during the process along with chanting of mantras. 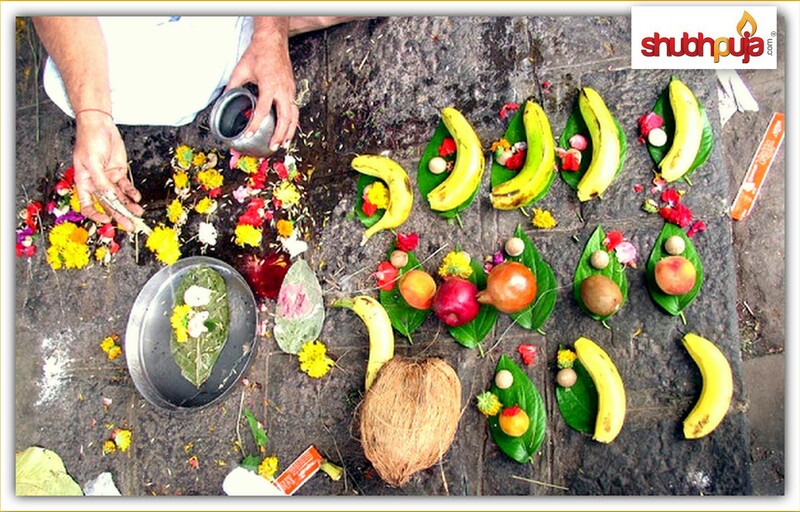 Favourite cuisines are specially prepared and offered to the priest or Brahmin after the puja. After feeding the Brahmins, food or ‘prasadam’ is placed in the balcony or terrace walls so that the crows can feed upon them, symbolic to our ancestors. Another solution is that on the day of any somwatianavasya (i.e. Amavasya on Monday), visit the peepal tree and offer ‘janeu’ to the tree and also to Lord Vishnu. Do 108 ‘parikrama’ of the tree by faithfully chanting ‘Om namobhagwate Vaasudewaya’. Have faith in him and seek forgiveness for your ill deeds. Pinddaan is offering rice, cow’s milk, ghee, food, sugar and honey to the ancestors, whole heartedly. Feed cows with ghee and rice balls every Saturday. Stand on the mat during sunrise and chant ‘Gayatri mantra’ to strengthen the position of Sun in your horoscope. Helping the poor and disabled and remembering your ancestors is an easy path to receive blessings for them. Avoid consumption of non-vegetarian food, alcohol and other such tamasic edibles along with outside food. In the south direction of your habitat, hang portraits of your ancestors and greet them with fresh flowers garland. Respect and seek blessings from the elders at our home, as their blessings is the only way to receive peace and happiness. Offer regular donations to hospitals or temples in the name of our ancestors and if possible, assist in the education and marriage of orphan girls. 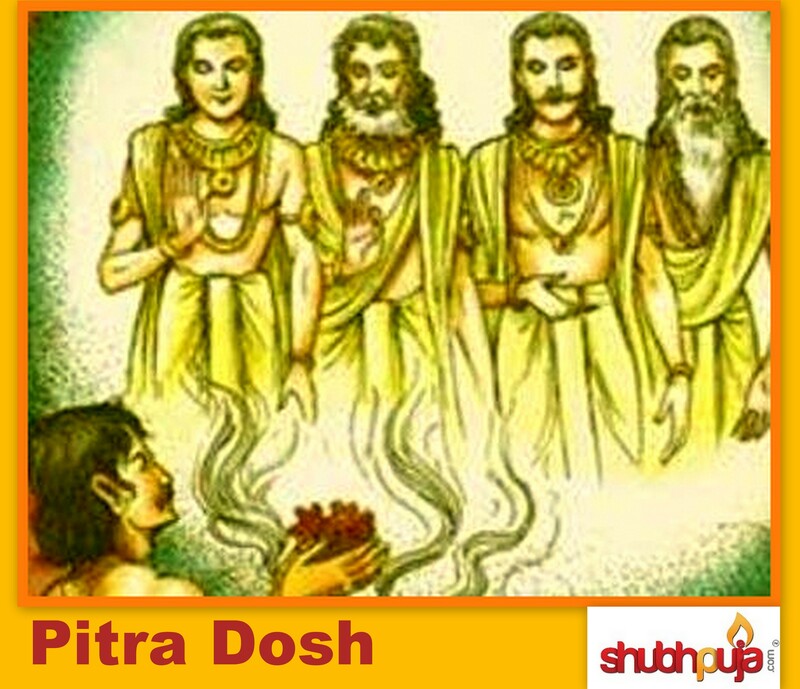 Performing ‘pitra dosh nivaran puja’ or ‘pitra dosh santushti puja’ is also one of the remedy to depart the negative effects and get rid of pitra dosh. This entry was posted in Puja and tagged amavasya, ancestors, auspicious, blessings, departed, food, have a little faith, holy, Lord Vishnu, lunar moon, mantras, offering, parikrama, peepal, pind daan, Pitra dosh nivaran, pitra dosh santushti, prasadam, Shradh, shradh puja, shubhpuja, shubhpuja.com, soul, tarpan, til seeds, tranquillise, Vedas. How is Pitra Dosh formed? As per the birth chart, the 9th house is the house of manes and fathers which is also the house of progress, promotion and spirituality. When the ninth house is under the influence of malefic planets such as Sun, Mars, Saturn or-Rahu and Ketu, who are mostly malefic for all ‘lagnas’. Particularly, if a conjunction occurs between Sun and the malefic planet Rahu in the ninth house, then ‘pitra dosh’ is formed. How to identify the presence of Pitra dosh? Fault in our stars, is not alone to be blamed as our actions decide our destiny. Man has to pay his debt, knowingly or unknowingly as nobody is spared in the court of ‘Karmas’. At extreme situations, when ball is not in our court then we try to figure out for the solutions as lack of awareness had darkened our conscious. Unfavourable influence of pitra dosh can lead to disruptions in the various sects of daily life. Married couple experience complications in the birth of a baby or even miscarriage a nd various other issues related to child birth. New born baby suffers from genetic diseases or possess physical deformities. Constant arguments among family members and lack of peace and happiness among relationships. The professional or career life is also hampered and our continuous efforts go in vain. Delay in marriages or disturbed love life. Scarcity in resources and continuous financial debts. Money is squandered on court cases and medical expenses. Unstable mind and lack of sound sleep. Dreams about snakes or ancestors demanding material possessions may also be observed. This entry was posted in Puja and tagged 9th house, ancestors, faith, financial debts, forefathers, happiness, have a little faith, karmas, ketu, Kundli, lagnas, manes, peace, Pitra dosh, pitras, rahu, scarcity, Shradh, shubhpuja, shubhpuja.com, spirituality. As we sow, so shall we reap; the saying is a direct indication of the fact that whatever deeds (good or bad) we perform during our journey, we get paid accordingly. Every action has an equal and opposite reaction, so similarly our ‘karmas’ affect our progress and failure, respectively. However, not everything is related to current Karmas and hence you may be affected by Pitra dosh. ‘Pitras’ refer to our ancestors, manes or anyone in our family who has departed this planet. If there has been a lack in our service towards our ancestors, when they were alive or existence of unfulfilled wishes in them, at the time of death; then ‘Pitra dosh’ may be bothering you. It also occurs when the departed soul do not achieve salvation. This entry was posted in Puja and tagged ancestors, death, forefathers, have a little faith, karma, ketu, lack of service, malefic planets, manes, moon, natives, Pitra dosh, pitras, rahu, salvation, Shradh, shubhpuja, shubhpuja.com, soul, sun, unfulfilled. The more we know about it, the greater it raises the curiosity within us to explore and analyse it further. The greatest epic in history, Mahabharat is an epitome of longest text that highlights the controversial politics, sibling rivalry, hegemony over women and power along with the increase in ‘adhrama’. Despite all this, the relevance of the epic, has still not lost its essence and is an inspiration for all. Apart from the widely known stories, till date the scholars discover the hidden secrets and unravel new mysteries as they comprehend the epic. • ‘Ganga putra’ Devavratha (Bhishma) was the eighth son who had been known for his principles and vows towards his kingdom. His vow of bachelorhood became the reason for the agony of Amba, who wanted to seek revenge for the denial of her proposal. Lord Subramanya appeared with the fresh garland of lotuses and it was said that whosoever would accept that garland would turn into an enemy of Bhishma. Later, when Amba came in her next life as the daughter of King Drupad, she wore this garland playfully as a child, but later she became the reason of his death in the form of Shikhandi. • Prabhasa (Vasu) was cursed by Vashishta to be born in the human world, as during one of the journeys Prabhasa’s wife insisted him to bring Vashishta’s cow. This made Vashishta angry and he cursed Prabhasa, so he was born as the eighth son of Ganga and Shantanu named, Devavratha. 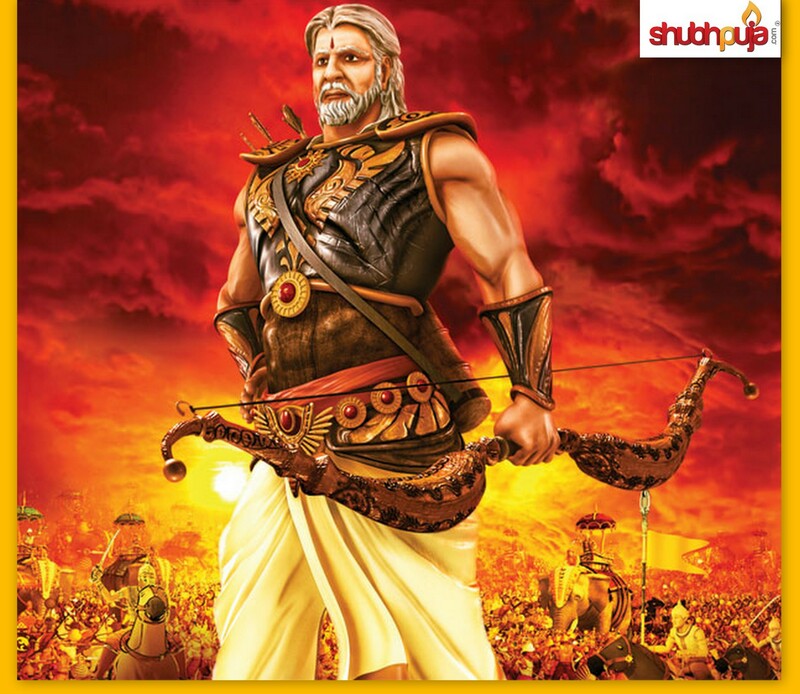 Bhishma, known for his valour and principles driven life, sacrificed his entire journey for the benefit of Hastinapur. Bhishma refers to someone ‘who takes a difficult vow’ and his duty as a son and further as a brother, father and grand-father are quite known to us. In spite of his courage and dutiful attitude, these qualities became his weakness too, as many times even when he knew that he was favouring the wrong side, still he carried on to do so because of his vows and value system. • He took away the three daughters of the King of Kashi for his younger brother Vichitravirya, but when he came to know about Amba’s love for someone else, he dropped her back to his father’s palace, which was indeed an act of disrespect. Her lover refused to marry her due to Bhishma. Bhishma couldn’t undo the promise, made to Satyavati’s father, of remaining a bachelor throughout his life so he denied the marriage proposal too. • His subservience towards the throne of Hastinapur made him stay numb and helpless during Draupadi’s humiliated disrobing in the court before King Dhritarashtra and everybody else. Bhishma is renowned for his mighty strengths but when it was actually needed to react and use his skills, he chose to be a puppet in the hands of external forces and overlooked the respect of women. • At times he unintentionally became a part of the evil strategies of Kauravas, as after the 12 years of exile when Pandavas were in their hiding period, he said that “there must be absolute law and order, as well as peace and prosperity prevailing wherever Yudhisthira stayed”. This gave an immediate clue to the evil Duryodhan and his skepticism made him reach King Virat’s kingdom. By keeping the gun on Bhishma’s shoulder, the Kauravas once again invoked King Virat to fight by snatching away his herd of cattle. • Bhishma was aware of the wrong intentions of Guru Drona against King Drupad, still he welcomed him to his kingdom and later on we saw that Guru used his students for his own selfish motives. This rivalry resulted in the animosity between Hastinapur and Panchal, which lasted till the end. Thus being an idol son and faithful towards his kingdom, he failed to follow the right path due to his ignorance and old values. Though he was following his words and expected the welfare of his kingdom but ultimately due to his reluctance of not adapting to the change, he could not alter the evil thinking of Kauravas. Being a great warrior, he tried to prevent the war by reconciliation between Pandavas and Kauravas, yet as it was already written, the war was essential for the end of ‘adharma’ and rise of the peaceful and righteous world once again. Bhishma had to suffer at his death bed as earlier in his 73rd life birth, he injured insects by piercing needles into their body. So at the end Krishna blessed him and freed him from the Karmic cycle of life and death and the curse of Vashishta. This entry was posted in Mythology and tagged adharma, Amba, bachelorhood, benevolant, Bhishma, dharma, Dhritarashtra, Draupadi, Drupad, Duryodhan, dutiful, Ganga putra, Guru Drona, Hastinapur, have a little faith, hegemony over power, Hindu, Karmic cycle, Kauravas, King of Kashi, King Virat, knowledge, Krishna, life and death, Lord Subramanya, Mahabharat, mighty, Mythology, Panchal, Pandavas, Prabhasa, principles, promise, right, Shikhandi, shubhpuja, shubhpuja.com, sibling rivalry, valour, Vashishta, vows, Yudishthira. 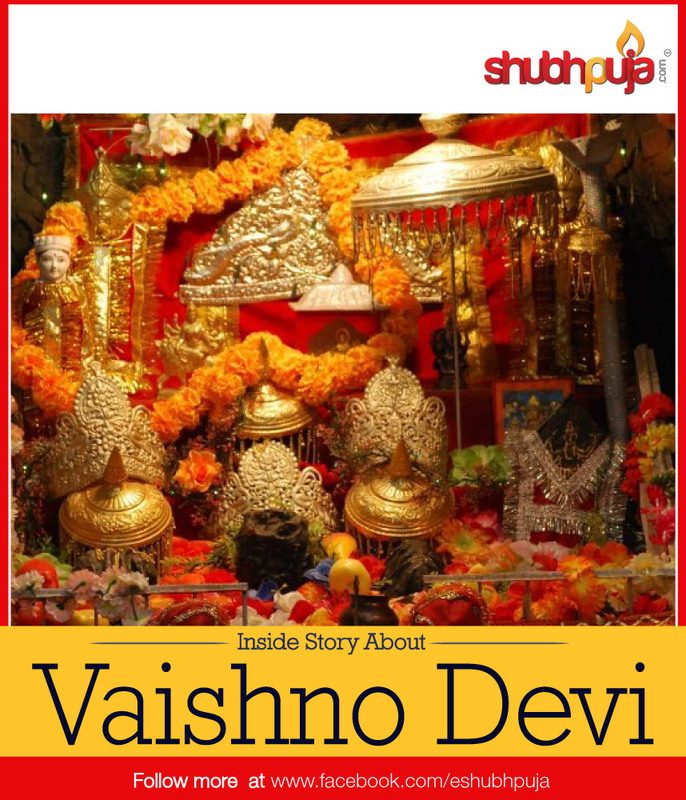 Vaishno Devi, one of the most widely visited shrines in India, sees an annual footfall of over 8 million people from across the globe. But very few people are aware of the fact that a trip to this holy shrine is incomplete without the darshan at the Bhairon temple. Bhairon Mandir, located at a distance of 1.42 kilometers from Bhawan is situated atop an adjacent hill involves a steep climb, which can be undertaken either on foot or on ponies or palanquins. It is the highest point of the entire climb and is situated at an altitude of 6619 feet. Legend has it that once a devotee of Mata Vaishnodevi, Sridhar organized a Bhandara (Community meal) in which the whole village and Mahayogi Guru GorakshNathJi along with all his followers including Bhairon Nath were invited as it was wish of Mata Vaishnodevi to invite MahaYogi Guru Goraksh NathJi. Guru Gorakshnath visited a Bhandara along with more 300 disciples including the Bhairon Nath. 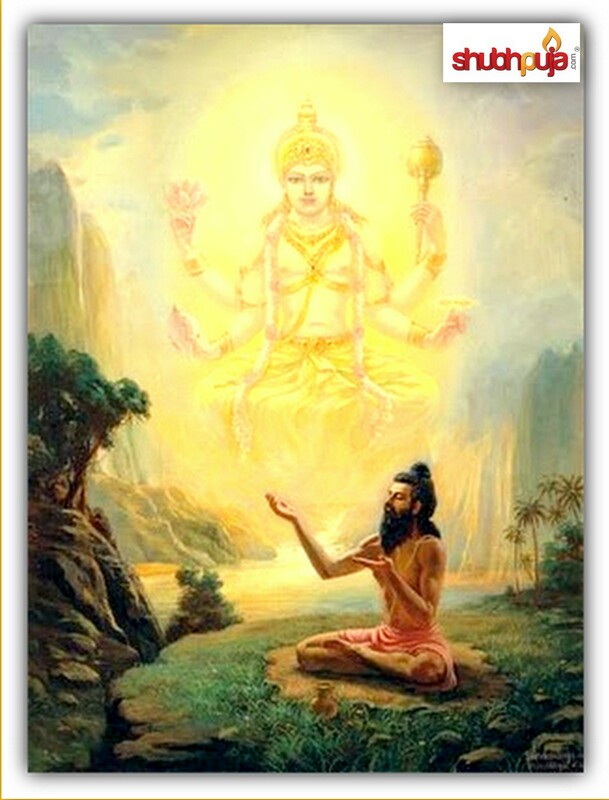 Bhairon Nath was amazed by seeing the power of divine mother. He wanted to test her powers. For this, he asked Shiv Avatari Guru GorakshnathJi for his permission. Guru Gorakshnath said I do not recommend but still if you wanted to test, go ahead. Bhairon Nath on locating the ashram started observing Vaishnavi secretly. He was enchanted by Vaishnavi’s extraordinary beauty and began to pester Vaishnavi to marry him. She tried her best to keep him away, but on failing to do so, she decided to flee away into the mountains to continue her tapasaya. Bhairon Nath however refused to give up and chased her down to her location. The goddess after halting at (present day) Banganga, Charan Paduka, and Adhkwari, finally reached the holy cave shrine. When Bhairon Nath continued to follow her despite the goddess trying to avoid a confrontation, the goddess was compelled to kill him. Bhairon Nath met his ultimate fate when the goddess, just outside the mouth of the cave, beheaded him. The severed head of Bhairon fell with force on a distant hilltop. Bhairon Nath upon his death realised the futility of his mission and prayed to the deity to forgive him. The almighty Mata felt mercy and gave him a boon that every devotee of the goddess would have to have the darshan of Bhairon after having the darshan of the Goddess and only then would the yatra of a devotee be complete. Hence it wouldn’t be wrong to say that Bhairon mandir is the final link of the pilgrimage. This entry was posted in Puja and tagged Adhkwari, Bhairon mandir, bhairon nath, darshan, Goddess, have a lilttle faith, Lord Rama, Mata Vaishno, shubhpuja, shubhpuja.com, spirituality, tapasaya, Vaishno Devi.